The soccer news starts with the USMNT’s 3-0 win over Panama. Out of window friendlies carry their own adjusted expectations, so putting too much into the result is problematic. All involved know this going in, weighing what happened over those 90 minutes against the work put in so far in camp. That’s the highlight for USMNT fans, with new players responding and doing good things. That included two of the three goals coming from players making their debuts at full national team level. How this carries over into March when USMNT coach Gregg Berhalter will have his first full availability is the question. We’ve seen January camp performances lead to steady opportunities for USMNT players, and that’s unlikely to change under Berhalter. Otherwise, what’s the point of January camp? It has to be more than just an opportunity for emerging players to train together in the USMNT environment. That should be the role of the youth national teams, putting players into the pipeline for an eventual chance at the full national team. What the USMNT looks like right now may be another work in progress, something that isn't likely to excite much of the fan base after spending over a year watching just that. How that changes for March is the big picture question hanging over Berhalter’s decisions for yesterday’s game and Saturday against Costa Rica at Avaya Stadium (3:30pm ET – Fox). Get the balance between emerging players and who he sees as the core of the squad right, and the USMNT could put together a compelling 2019. That’s the job, after all. Also in the soccer news, former USMNT player and USMNT assistant Richie Williams is the new coach of Loudoun United, DC United’s USL affiliate. The USL Championship team begins play this season as one of 36 teams in the latest revamp to the second division. Loudoun United is one of seven expansion teams, with USL losing FC Cincinnati to MLS and three teams dropping down to the third division now called USL League One. “I’m honored to be named the first head coach in Loudoun United FC history and I'm looking forward to getting to work immediately,” Williams said in a press statement. "I have a long history with DC United and spoke with Dave Kasper who is equally as excited about the Loudoun United project. We have a new opportunity to develop players, identify prospects in an area that's rich with soccer talent while also competing at a high level in the USL Championship. We have been working hard behind the scenes to build our roster for 2019 and we've got some work to do before our March 9 USL opener against Nashville. I'm looking forward to the challenge and can't wait to get to know the Loudoun United fans." Concacaf announced that FloSports has the English-language rights for the Nations League in the United States. FloSports is the online channel that recently bought the rights to DC United’s home games. 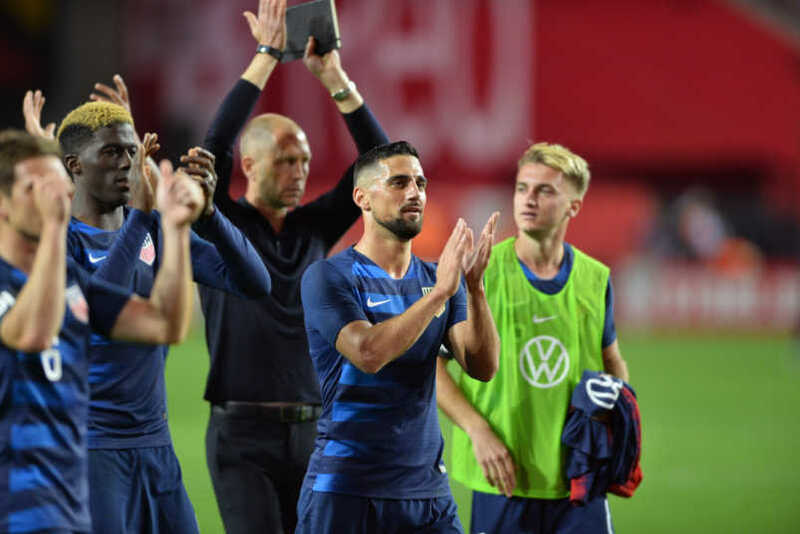 The LA Times' Kevin Baxter reports on the USMNT's win in Arizona. Goal's Ives Galarcep makes a list including what Michael Bradley did for the USMNT. SI.com's Avi Creditor focuses on Gregg Berhalter's debut. Yahoo Sports' Doug McIntyre on the USMNT's win. MLSsoccer's Charles Boehm picks up with Atlanta United's preseason and the challenge of defending a title. The Athletic's Joshua Kloke reports on the situation with Seb Giovinco. The Guardian’s Dominic Fifield with Spurs manager Mauricio Pochettino’s response to getting knocked out of the FA Cup. The National’s Andy Mitten takes an in-depth look at Wolverhampton Wanderers. Soccernomics’ Stefan Szymanski makes the case for insurance for failing soccer clubs.